Sadly, it ain’t so. 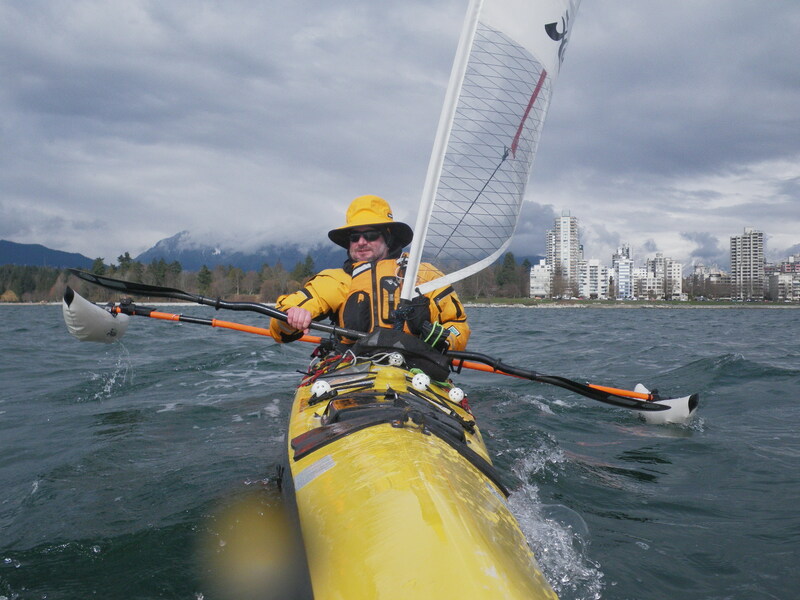 Once I turn downwind, the apparent wind is reduced to 9 knots minus my 3 knot paddling speed, or a mere 6 knots. So the wind pushing me home is only moving half as fast as the wind I fought against while outbound. Even worse, the wind’s resistance — or assistance — increases exponentially with its speed. So that 6 knot tailwind works for me with only a quarter of the power that the 12 knot headwind worked against me. The only way to offset this decrease in wind force is to harness a lot more of it. Time to hoist the sail. *Knots are a measure of speed used for boats. Substitute MPH or KPH if you want — all the math will work the same. Once the sail is up, I trim it, turning it to the optimum angle for the wind direction. Fluttering fabric is ironed into a taut curve as smooth airflow displaces turbulence. 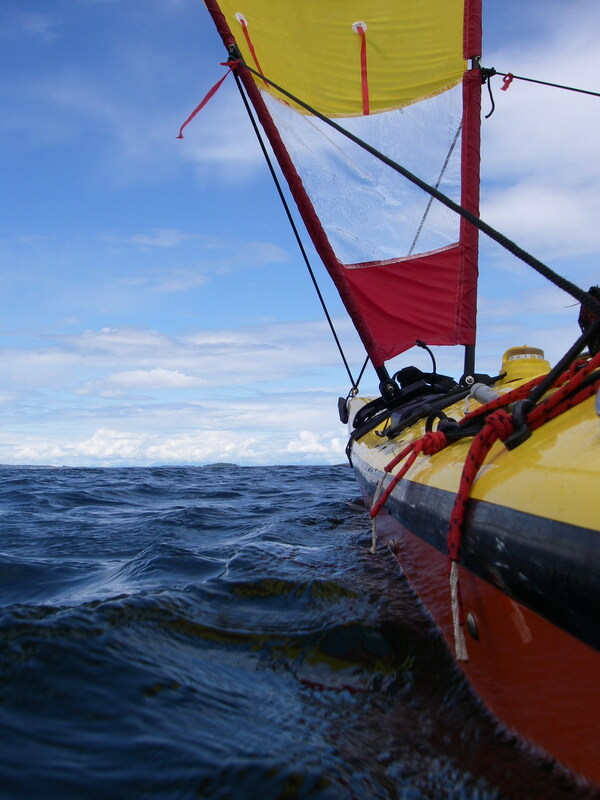 With the wind streaming steadily across the front and back of the sail, it both pushes and pulls me on my way. In a light breeze, I set a second sail and listen to the soft gurgle of water parting under the bow. In a strong wind, a single sail speeds the kayak as if the rudder pedals beneath my feet were accelerators. The boat cleaves through each successive wave or races up the fronts and falls with a splash onto the far faces. For physicists, air is a fluid. Which means that in a very real sense, we live at the bottom of an ocean of air, earth’s atmosphere. What we usually think of as the ocean is actually the lower and denser of two layers of fluid that girdle the globe. So when I hoist my sail and seize the wind, I am riding the currents of an upper sea and dancing on the interface of two vast oceans. 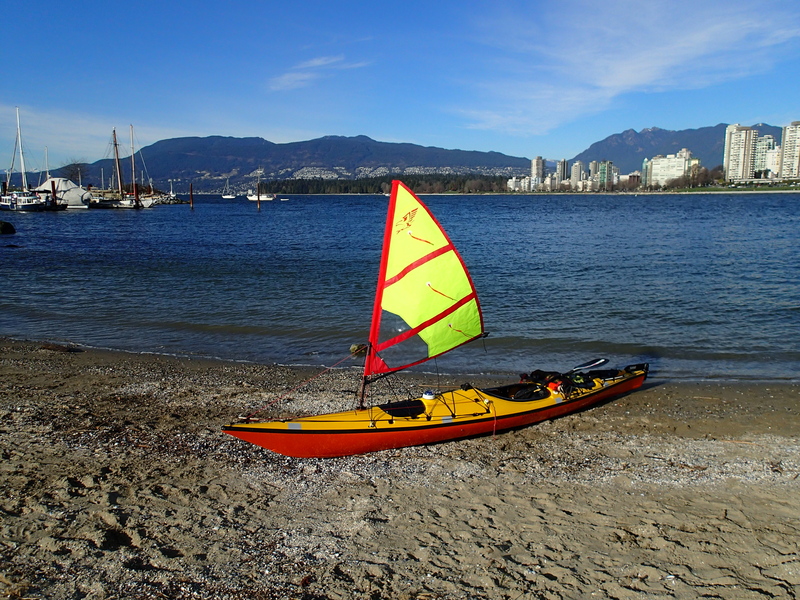 This entry was posted in Kayak Sailing, Sea Kayaking and tagged Falcon Sail, Kayak Sailing, Kayaking, Sea Kayaking by Philip Torrens. Bookmark the permalink. Phil, have you paddled from the Island to Galiano or Valdes before? Interested in distance, conditions for a varied group of paddlers. Paul, I’ve never done either of those trips directly all in one go, since I usually take a ferry from the mainland to whichever Gulf Island port is nearest my planned route. But I have done all the legs of both trips over the years. I think if you went in the summer, planned for short hops each day, overnighted at Portland Island, Wallace Island, Tent Island or Pirate’s Cove (depending on where you put in on Vancouver Island), got early morning starts, and monitored the marine weather forecast, those trips should be doable by most people capable of paddling a few hours a day and handling their boat in light seas. I’d also highly recommend The Wild Coast, Volume 3 by John Kimantas for detailed information on routes, campsites and hazards. Happy, safe paddling.